Delegates to the 127th Continental Congress enthusiastically endorsed the DAR Pathway of the Patriots as another meaningful gift to the nation in preparation for our Nation’s Semiquincentennial celebration in 2026. This project affords DAR members, chapters, state societies and the public the opportunity to honor the memory and spirit of the men and women who achieved American independence by adopting a tree in memory of a Patriot along a 25 mile path beside the Schuylkill River in Pennsylvania from Bartram’s Garden to Valley Forge. Each of the 250 trees along the Pathway will honor a specific Patriot of the donor’s choosing, subject to approval by NSDAR. 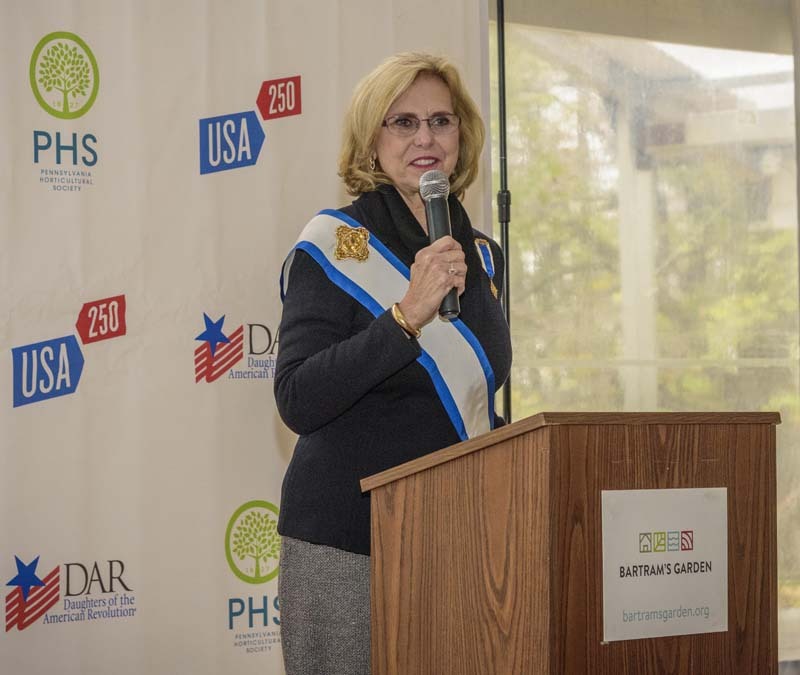 The DAR has partnered with USA 250, the Pennsylvania Horticultural Society (PHS) and Bartram’s Garden for the Pathway project. 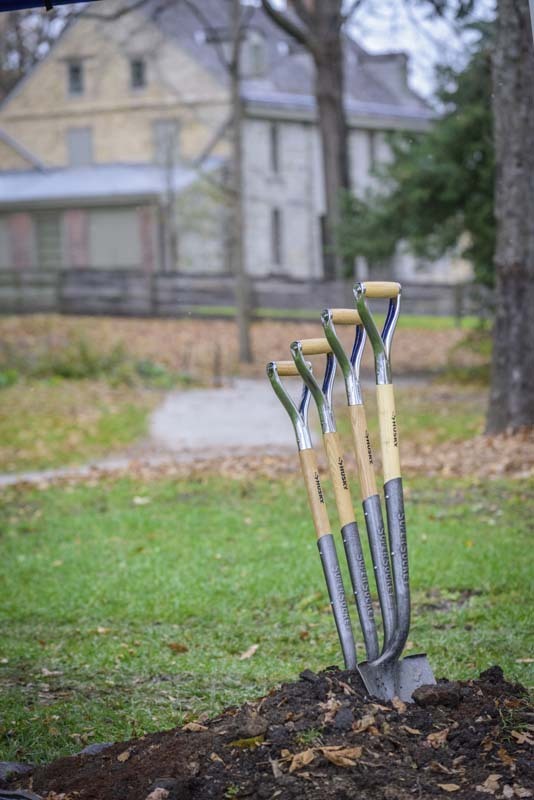 The first trees were planted on November 15, 2018 at Bartram’s Garden, the nation’s oldest botanical garden which was established just outside Philadelphia in 1728. John Bartram traveled all over the colonies collecting seeds and growing them in the garden. He welcomed George Washington, Thomas Jefferson and other Founding Fathers to his gardens. As the men made their way down to the river’s edge, they were seemingly unconcerned with order or layout. Beauty was all around them and they were above all relieved to be freed from the heat, frustration and locked doors of the State House. They reveled in inspecting plants they had never seen before and took a particular pleasure in the exquisite white flowers of Franklinia alatamaha, a small tree that William [Bartram] had recently named after Benjamin Franklin. The Franklin tree was the rarest of all American plants in the garden, because it could be found only in one particular location in Georgia. The tree was such a horticultural wonder that botanists pilgrimaged to Philadelphia to see it. Only the British were awkward about the discovery, preferring the name Gordonia pubescens and refusing Franklinia alatamaha – which was probably not surprising, given Franklin’s role in the American Revolution. 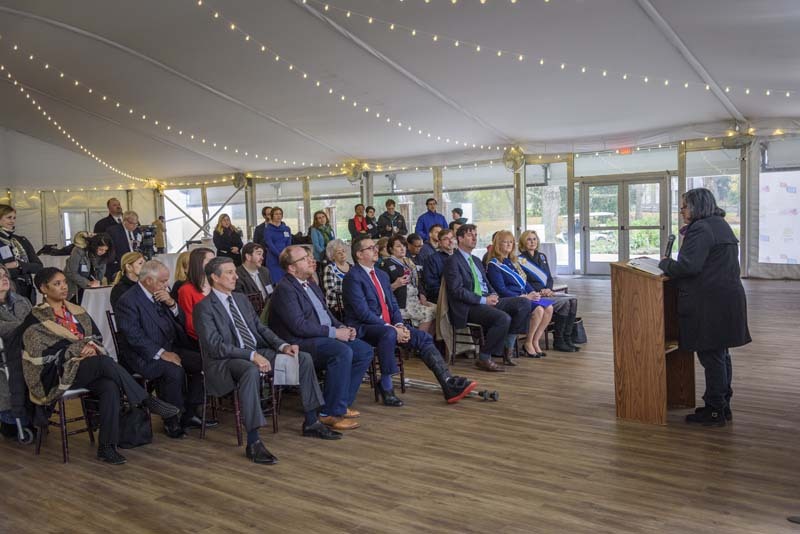 Other speakers included Dan DiLella, Chair of the United States Semiquincentennial Commission, and Historian General Ginger Hudson Trader, who shared some of DAR’s previous gifts to the nation. 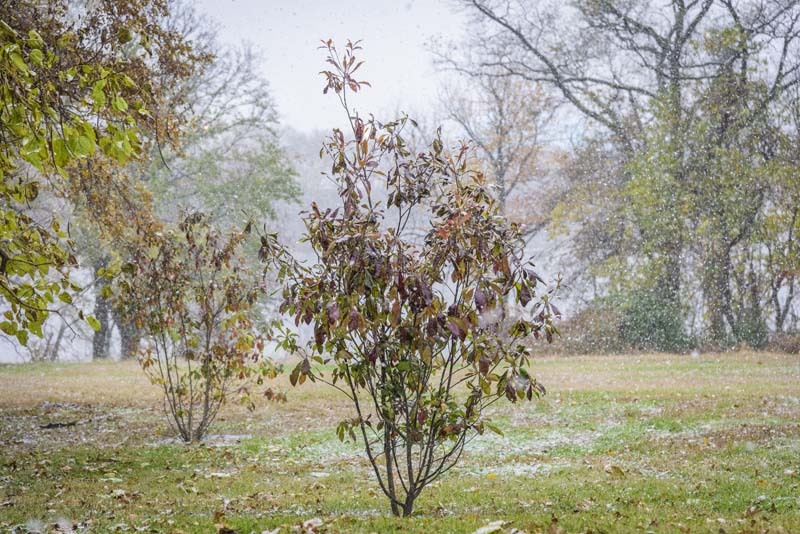 As Andrew Hohns, Semiquincentennial Commissioner and USA 250 Chair, was speaking, the first snowfall of the season began. He remarked how evocative it was of the brutal winter of 1777 at Valley Forge and the sacrifice of our nation’s founders. I was honored to share our enthusiasm for the project and for the opportunity to tell the story of the Patriots regardless of where or how they served. Stepping outside, we each took turns shoveling dirt on these trees which overlook the Schuylkill River. The PHS selected Franklinia alatamaha, a small flowering tree named for Benjamin Franklin, as the first trees to be planted. I look forward to returning to Bartram’s Garden to see the trees in bloom. We have enjoyed working closely with our partners, including Glen Abrams of PHS who has served as the project manager. Glen remarked how much he loves this project – despite the fact he was born in England, raised in Canada and is now a U.S. citizen. I can’t wait to share with Glen that Bobbi McMullen, Pennsylvania Honorary State Regent, discovered military and patriotic service for William Bartram. Perhaps the Garden would consider honoring William’s service with one of the trees. Thank you to all the Daughters who have enthusiastically supported this project. 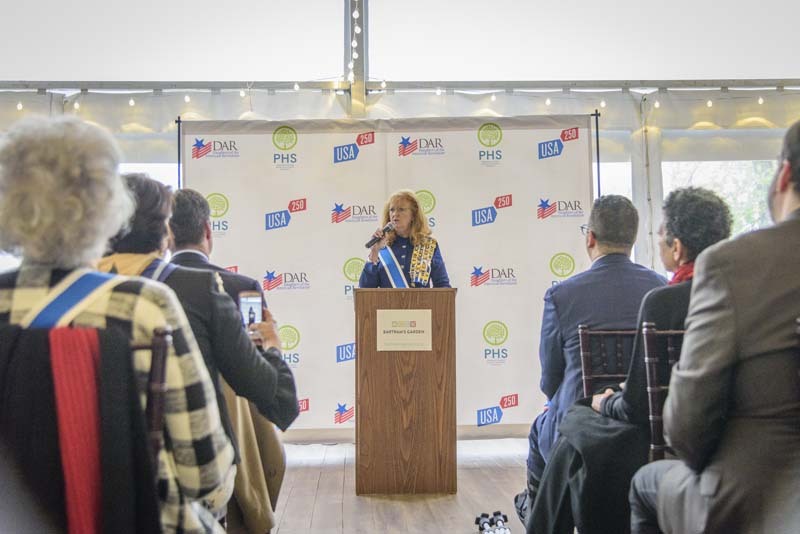 The next trees will be planted in the spring and PHS will select the best variety of nursery grown trees to be planted in 13 groves along the Schuylkill River Trail. DAR looks forward to developing a robust educational component to share the biographies of each of these 250 Patriots. As there are fewer than 80 trees left available for purchase, please do not delay if you wish to support this project. Please visit the Committee website at www.DAR.org/pathway to learn more. #TBT 125 years ago, on April 19, 1894, the Sequoia Chapter in San Francisco, California, planted a �... 20 hours 14 min ago.